Five teenagers have been convicted of killing a father who was mistakenly targeted in a fatal stabbing. Daniel Frederick, 34, was knifed repeatedly by the group just yards from his home in north London. One of his attackers, aged 16, had sought revenge after his friend was attacked in prison by local gang the "Shakespeare Boys", a court heard. 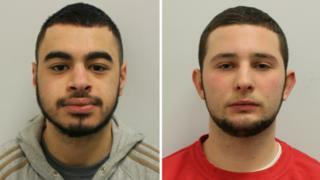 Following a trial at the Old Bailey, four teenagers were found guilty of murder and manslaughter. The 16-year-old boy, who cannot be named for legal reasons, pleaded guilty to Mr Frederick's murder. Kacper Karasinski, 19, of Hackney, and a 17-year-old boy were found guilty of murder. Yigiter Gok, 18, of Stoke Newington, and another 17-year-old boy were found guilty of manslaughter. Father-of-four Mr Frederick was returning to his home on Shakespeare Walk, Stoke Newington, with his pregnant partner when he was attacked on 8 January. Prosecutor Allison Hunter QC had told jurors the attack "lasted no more than a few seconds, during which Daniel Frederick received seven stab wounds to his back, buttocks and thighs". Witnesses saw the "sinister and intimidating" youths wielding knives as they walked purposefully towards Mr Frederick, wearing dark clothes, hoodies and masks, the court heard. Afterwards, the young men were picked up on CCTV cameras as they ran off towards the Hill Court Estate in Hackney, shedding clothes as they went. Met Police Det Insp Paul Considine said: "This was a ruthless, violent and unprovoked attack in which Daniel stood no chance. "This was a complex investigation made more difficult as Daniel was mistakenly targeted by his attackers." Within an hour and a half of police issuing a public appeal, Karasinski booked a flight to Oslo, but was arrested at the airport. Gok fled on a ferry to France and travelled on to Turkey before returning to the UK in March. None of the defendants reacted as the jury delivered its verdicts. They were remanded in custody to be sentenced at the Old Bailey at a later date.